Hello everyone and welcome to another edition of The Anime Pulse! It has been a while since I’ve sat down and wrote an actual column, hasn’t it? I kind of went into review mode as I embarked on the Makoto Shinkai Series… a project dedicated to reviewing the majority of works written or directed by Makoto Shinkai. In case you missed it, you can find them all by going to the Anime Reviews section of the site or just click on my name at the top of the column! I also wrote a review on the first volume of the Master Keaton manga, provided to me by VIZ Media. I am currently working on getting Volume 2 so I can continue reviewing the series as it has been quite the interesting read! I also have Tiger & Bunny: The Rising from VIZ that I need to review as well so you can look forward to that soon. But enough about playing catch up… what this column is being geared towards is a preview of the 2015 Spring Anime Season! The Winter Season has come to an end and we are in that nice little lull between the end of the old shows and the start of the new ones. This means that I now have plenty of up-to-date material that I will be reviewing over the coming weeks, but it also means I have brand new material to watch and review later on. For those wondering, the shows I will be reviewing in the coming weeks will be Death Parade, Shinmai Maou no Testament, Saenai Heroine no Sodatekata, Tokyo Ghoul √A, and Durarara! !x2 Shou. I am still currently watching Assassination Classroom and World Trigger as their seasons are continuing on into the Spring season. Of course, these shows are also alongside Naruto: Shippuuden (if it ever decides to stop milking the cow and get back to canon material) and Fairy Tail, which is finally going to start the Tartaros Arc! Can’t wait for that! So what shows am I looking forward to in the Spring season? Well, honestly, there are a lot of shows coming out, but a lot of them just seem.. well.. “meh.” I was able to find a few shows with interesting descriptions, but I’m still proceeding with caution as the last time I thought a show looked good based on its description, it turned out to be Absolute Duo, but since this doesn’t generally happen all the time with me, I’m hoping to place some safe bets that I picked out a few good ones to watch in the upcoming months. Of course, before I start name dropping series, I would like to point out that for any anime I watch, I do not read the manga unless the anime has my attention so much that it makes me want to go read the source (like Tokyo Ghoul did.) So when I name these off, I’m going by the anime descriptions themselves and whether or not it sounds appealing to me. So if you’re a manga reader of a particular series, please refrain from messaging me with any spoilers and such. 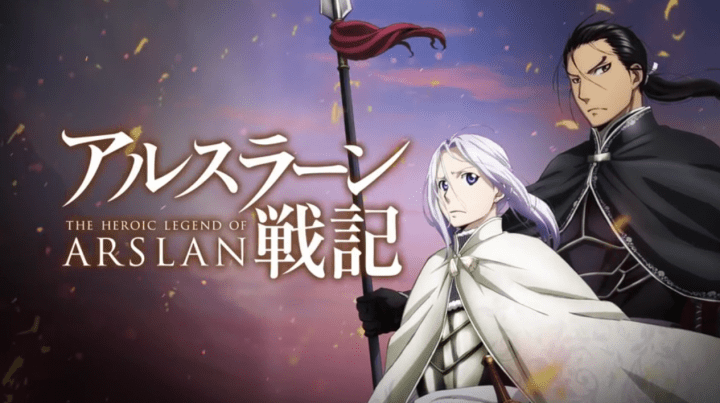 Arslan Senki – Fallen kingdoms, war, the clashing of swords and boards.. all things that I love. That’s the first thing that attracted me towards this anime. The art style for the promo poster also gives me an idea of the setting and what the overall tone looks like. It also has a tale about a prince who believes he cannot live up to his father’s expectations and at the young age of 14, loses everything near and dear to him. He goes on a growing up journey in an effort to take back his fallen kingdom. Interestingly enough, there was a 6 episode OVA that aired in Japan of this series from 1991 to 1995. This anime looks like a re-telling of the OVA series since the story is virtually identical. The art style is definitely updated to more of a modern look, which should please those who are concerned with such things, but since there are two series, if I end up liking the remake, I’ll go back and watch the original. Seeing the scores for the original is also giving me high hopes for this series. Most of the review scores for the OVA haven’t been below an 8 out of 10. While I usually like to formulate my own opinion, seeing others enjoy it is always a positive thing. 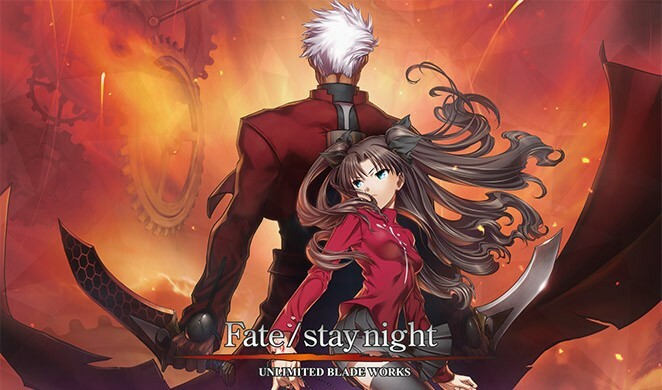 Fate/Stay Night Unlimited Blade Works: Season 2 – This is the second part of the Fate/Stay Night remake in order to update all the art so that it is equal to its prequel, Fate/Zero and another excuse to sell limited edition Blu-Ray sets for $500 a pop, but hey… I’m a Fate fan, and even though I own the original series on DVD, I’ll still watch this since I already watched the first part of the season and really enjoyed the retelling of the story. 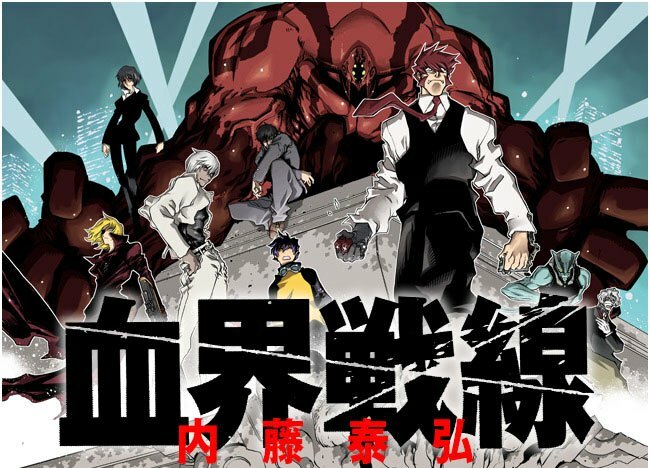 Kekkai Sensen – Oh Japan and your ocular powers. The promo poster shows our protagonist gripping his glowing blue runic eye so I’m guessing he has some sort of power. A fair, deduction, right? Well… according to the description, I’m assuming this eye power will play a role into what I’m describing as the Japanese Anime take on our show The Dome. I’m sure you’ve heard of The Dome… some people in a village are trapped under an invisible dome and they fight for survival? Japan must have saw that because they’re basing this anime in New York City and the entire city is trapped inside… you guessed it! A Dome! As much as I would like for that to happen in real life (apologies to my colleague Clinton Bowman), it just seems boring if you left the premise of the show like that. So we add in an alien invasion from an alternate dimension to torment the poor New Yorkers trapped inside of The Dome. Why? Because Japan… that’s why. I will actually be disappointed if there is no bad “Engrish” to be had in this series. There needs to be at least one stereotypical Engrish-speaking New Yorker. There just HAS to be! 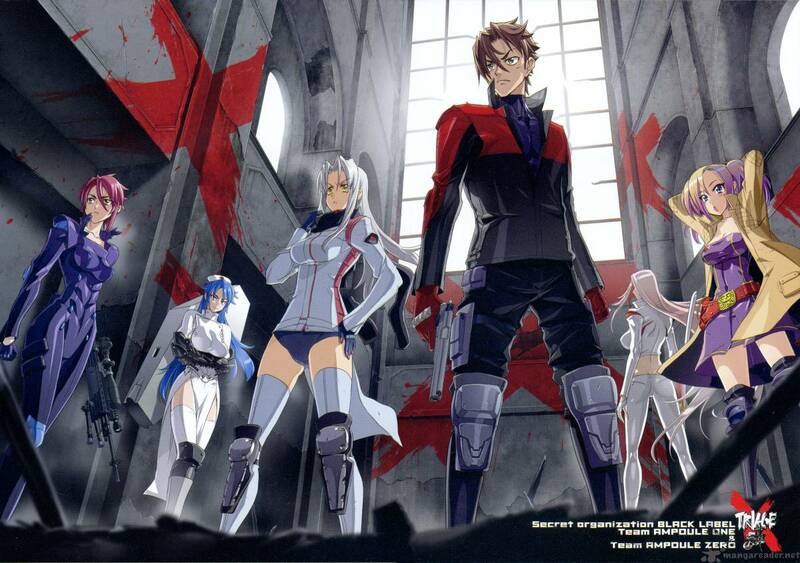 Triage X – Highschool of the Dead was either hit or miss with anime fans mainly because of scenes like this and Triage X looks to be the same since it’s coming from the same creator: Shouji Satou. Rather than a teen boy befriending a bunch of well-endowed females to fight against the zombie apocalypse, we have a teen boy befriending a bunch of well-endowed nurses at a hospital who just happen to be trained in military tactics to go against a mercenary group. I really don’t have anything else to say.. I think that just speaks for itself. Needless to say, I’m sure this will generate a few action figures, body pillows, and maybe a bed spread or two. Those are the shows I will be following, mainly. A little bit of a short list this season. I usually pick up between six and eight shows, but only four of them grabbed my interest. There are some sequels coming out which were automatically eliminated from my list because I haven’t seen the previous installments and anyone knows that with anime, you can’t just jump right into a sequel because you will be completely lost if you do so. So as you can see, PLENTY of sequels that kind of hindered my list, although to be fair, in the Summer season, I will be watching Working!! !, Durarara! !x2 Ketsu, and Non Non Biyori Repeat, so I’ll get my fair share of sequel love! I will probably do a column in a few weeks giving my initial impressions on the spring shows. Until then, I’m going to have plenty of reviewing to do so look forward to all of that! That’s going to do it for me this time. If you would like to drop me a line and give your thoughts on the Spring 2015 Anime Season, what shows you’d like to see, what shows I should be watching that I didn’t mention, or just general comments, you can send them to joshpiedra@theouterhaven.net and I will be sure to include them in a future column!